The setting is benign enough, a church supper, right? Ha! But something is missing! 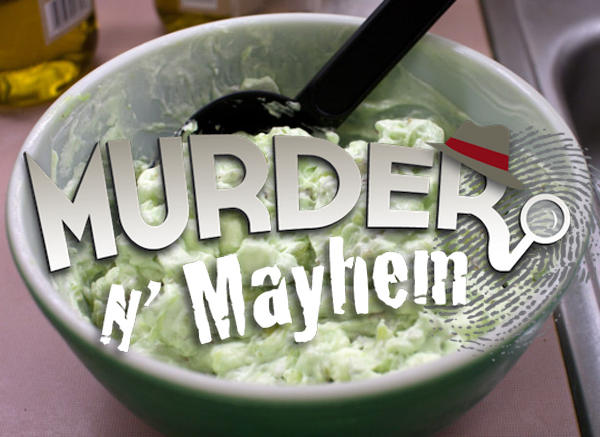 The scandalous discovery that the beloved green marshmallow salad is ....... Oh, no not that! Where did the Pastor get to? Who has done the dastardly deed? Was it Bizarre-o-clad-in-black-songstress Phil(osopher)? or Drama queen Mrs. Keal? Or the unemployed reverend and his very strange wife? No-nonsense matronly Tess? Even the singing head trustee and the pianist are suspects up until the very end. Help us figure it out. The play starts at 6:30 pm and is general seating so come early and be sure to wear something green. Tickets are 300 pesos each and include Philo’s famous all-you-can-eat-ribs, served family-style. A vegetarian selection will also be available. Stop by Philo's to pick up your tickets, telephone David at (329) 295-5148, Florrie at (329) 295-5651 or email lacruzamigos@gmail.com. Philo's Bar is located at Calle Delfin No. 15 in La Cruz de Huanacaxtle, Riviera Nayarit. Tickets go fast for this event…. and remember as this is a benefit for Amigos de La Cruz you can feel good about having fun!